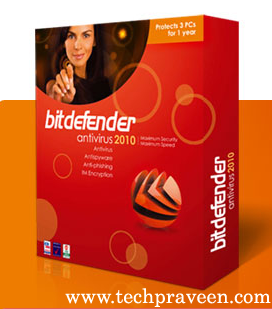 Get free license of BitDefender Antivirus 2010 worth $25. The promotion is run by the popular UK website v3.co.uk and runs for just 24 hours starting midday CEST Friday 13 August and ends on midday CEST Saturday 14 August. Whats written on Promo Page? BitDefender Antivirus 2010 is a powerful, accurate and highly configurable antivirus tool that delivers everything you need to keep your PC malware-free. The core antivirus engine is constantly scanning all your internet, email and instant messaging traffic, for instance, detecting and blocking known threats before they’re able to install. Two additional proactive technologies are used to uncover brand new threats, while keeping false alarms to a minimum. And the results are so good that independent testing labs AV-Comparatives awarded the program their highest Advanced+ rating in the May 2010 Retrospective/ Proactive test. 1. Goto Bitdefender 2010 Promo page. 2. Fill Name and a valid email Id.